Almost every ESP does not accept connections on port 465. Port 465 was never published by the Internet Engineering Task Force (IETF) as an official SMTP transmission channel but was registered as a SMTP port by the Internet Assigned Numbers Authority (IANA). This port was initially used for the SMTPS encryption and authentication “wrapper” over SMTP. It was introduced to securely send emails using Secure Sockets Layer (SSL). SSL was commonly used for encrypting communications over the internet. By the end of 1998, IANA has reassigned this port number for a new service. Port 465 was assigned for about a year before it could be revoked and a new protocol command “STARTTLS,” introduced in RFC 2487. This allows SMTP servers to communicate over existing ports by promulgating whether the destination server supports TLS encryption. But there are many services that continue to offer the deprecated SMTPS interface on port 465. Service providers that maintain port 465 do so because older Microsoft applications do not support STARTTLS. 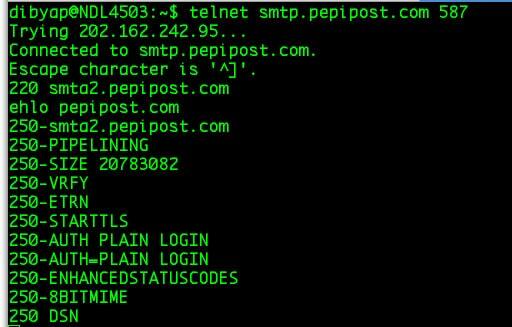 Pepipost supports TLS, this you can verify by connecting to smtp.pepipost.com and issuing an “ehlo” command. 250 STARTTLS in output confirms that the endpoint accepts TLS connection requests. How to check if Port 465 is blocked on your network? There are multiple ways to check if a particular port is blocked on your network, the simpliest one to check this is using the telnet command on your terminal as shown in the above screenshot. If Port 465 is blocked, you will get a connection error or no response at all. This port, coupled with TLS encryption, will ensure that email is submitted securely and following the guidelines set out by the IETF. IANA initially assigned port 465 for an encrypted version of SMTP called SMTPS. However, IANA since has reassigned this port for a different use, so it should no longer be used for SMTP. When a mail client or server is submitting an email to be routed by a proper mail server, it should always use this port. Port 465 is no longer an accepted standard for SMTP. Don’t use port 465, because this port is no longer an accepted standard for SMTP since it has been reassigned for a different us.